There was no hesitation when Todd Castledine was asked to pick out three lures he would rely on to catch big bass anywhere in Texas at any time of the year. As the old saying goes, don�t mess with Texas. However, if you want to mess with some big bass in Texas then Todd Castledine of Nacogdoches, Texas, is good guy to get a few fishing tips from. Castledine may not be well known on the national level bass tours yet, but those who compete against him in regional circuits around the Lone Star State know him all too well. His track record around his home state is as blistering as the summer Texas sun. 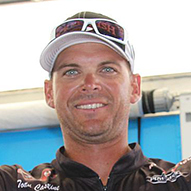 He is a two-time FLW Series winner and he owns three FLW Series Angler of the Year titles. Beyond that, his resum� with team partner Russell Cecil in regional team circuits such as Bassin� Bucks, Bass Champs, Ram Open Series, TTT and Angler�s Quest is littered with wins and points titles. What�s more, Castledine�s uncanny ability to drop 25- to 35-pound limits into the till at weigh-in is stunning. His fishing mindset is similar to that of other great Texas sticks like Ray Hanselman or Dicky Newberry: Fish only for big ones all of the time. As a result, you will not find any spinning rods or dropshots in Castledine�s boat. Given Castledine�s proclivity for catching Texas lunkers, he seemed a perfect candidate for an edition of Pros Pick Three. Except in his case, there�s an added Texas twist: Castledine�s three must-have lures for big bass in Texas � three lures that he feels can be taken to any waters in Texas at any time to catch the biggest bass. �I already know exactly which ones they are,� Castledine said after being pitched the premise. �If I�m fishing in Texas, all three can be found on my deck at all times. The first lure Castledine wants to discuss is Strike King�s Popping Perch and for good reason ��he helped design the bait with big bass in mind. When creating the Popping Perch, Castledine wanted a big profile topwater that could be worked fast. The other reason the Texan favors speed is so he can cover water quickly and efficiently. Castledine admits that the coldest weeks in January may not be the best time for the Popping Perch. �But it�s safe to say that bait can be used 90 percent of the time to hunt big fish in Texas,� he added. His favorite combo for the Perch is a 7�3� extra-heavy action Falcon Cara T7 Reaction casting rod with a Lew�s Super Duty casting reel (8:1 ratio) and 65-pound test Sunline FX2 braided line. When kidded about the bazooka-like power of his set up, Castledine was unfazed by the ribbing. Castledine says he is in favor of fishing with the heaviest tackle he can get away with. 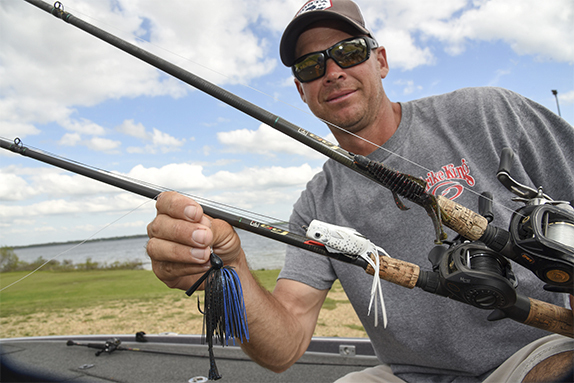 For Castledine, it a go-big-or-go-home mentality when fishing around his home state of Texas. For choice number two, Castledine opts for a Strike King Rage Bug rigged beneath a 3/8-ounce worm weight. When prompted for a color, California craw got Castledine�s pick as the best all round hue for the Rage Bug. Like other previous participants in Pros Pick Three, Castledine also secured a �-ounce jig as one of his choices. 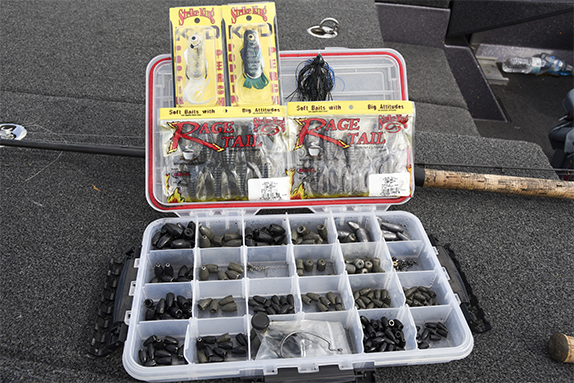 The good old �-ounce jig rules as a popular choice due in large part to its extreme versatility and reputation for garnering quality bites. He points out that the jig market has become highly specialized these days. There are specific shapes and sizes made for precise presentations such as swim jigs, football-head jigs, skipping jigs and finesse jigs. But to some degree, they were all derived from a standard �-ounce jig head with a rubber skirt and a weed guard. As for color, black/blue or blue craw suits him just fine. For a trailer, he sticks to a Rage Bug. With his three lures chosen, there was one question remaining: What about the good old-fashioned Rayburn Red Rat-L-Trap for big bass in Texas?